Eco-warriors rejoice! Somerset House restaurant Spring is fighting food waste with their zero-waste pre-theatre menu. Wonky veg is definitely a major food trend at the moment. Even major supermarkets are selling boxes of misshapen vegetables that would once have been discarded. Well, now you can do your bit in the battle against food waste by trying Spring’s pre-theatre ‘scratch’ menu. 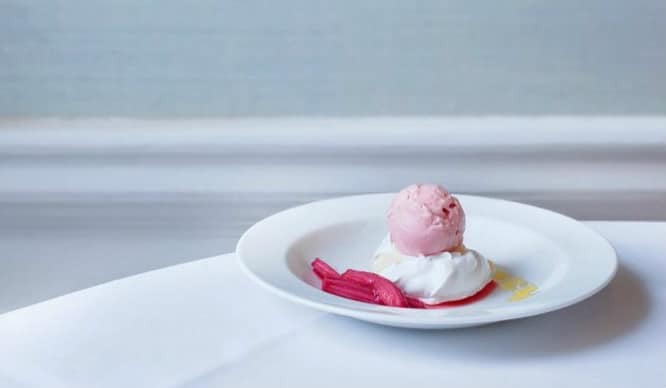 The menu costs £20 for three mouthwatering courses and you’ll be able to enjoy these dishes in the beautiful surroundings of Spring, located in the New Wing of Somerset House. Another excellent opportunity to spend a little time wandering through the lovely Somerset House courtyard! 40% of all vegetables grown in the UK are thrown away due to minor cosmetic defects. Mutant carrots, deformed potatoes, and crooked courgettes never see their culinary debuts, despite being perfectly tasty. In fact, 1/3 of all food grown or manufactured in the world is thrown away. To put that in perspective, that’s enough to feed 870 million people. The good news is, loads of businesses are attempting to combat this particular issue, and the masterminds behind Spring are doing their bit with their ‘scratch’ pre-theatre menu. They’re hoping to ‘draw attention to the fact that this produce, despite its appearance is still truly delicious’ and we couldn’t agree more. You’ll find Spring at Somerset House, New Wing, Lancaster Place, WC2R 1LA. The scratch menu is available from 5:30pm – 6:45pm daily.